gnawed at his own heart, pining for battle and the war-cry. Continued next week. Tomorrow's installment from Kim by Rudyard Kipling. From the earliest days of Ancient Greece, the author(s) of this poem were contemporaries of the writers of the Bible's Old Testament. 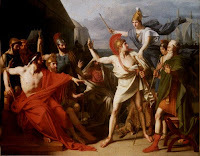 Summary of First Book: The quarrel between Agamemnon and Achilles--Achilles withdraws from the war, and sends his mother Thetis to ask Jove to help the Trojans--Scene between Jove and Juno on Olympus. Painting: The Wrath of Achilles by Michael Drolling, 1819.